This is a gourmet breakfast that I had been dreaming about for years. I kept trying all of these different breakfast sandwiches and found none of them had all of my ideal elements. 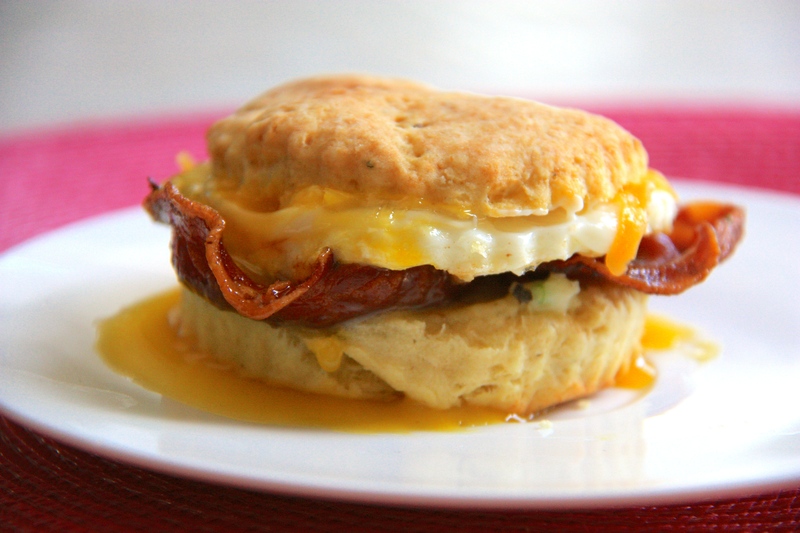 So I left it to myself to create my dream sandwich: buttermilk cheddar biscuit, pancetta, fried egg, cheddar cheese, and chive butter. Feel free to add any other additions to make this your own delicious sandwich. For the biscuits, in a bowl whisk together the flour, salt, baking powder, baking soda and pepper. Using a food processor or by hand, add the cold butter to the flour and mix until the butter is pea-sized. Add the buttermilk and cheddar and mix to combine. It should be a moist dough. Kneed gently and flatten the dough out until it is about 1/2" thick. Fold the dough about 5 times, gently press the dough down to a 1 inch thick. Using a round cutter, cut out the biscuits and place onto a sheet pan lined with parchment paper. Bake for 10-12 minutes, or until they have risen and are lightly golden. Cool slightly. Meanwhile, place the pancetta slices on another sheet pan lined with parchment and bake in the oven until they are crispy, 6-8 minutes. To make the fried egg, add butter to a frying pan over medium low heat. Crack the egg and place in the pan. To ensure even cooking, cover the pan with a lid for a minute. The egg will take a couple minutes to cook. Repeat with the remaining. To make the butter, combine the softened butter, chives, and salt and pepper to taste. To assemble the sandwich, slice the biscuits in half. Spread the butter on one half and place the pancetta on top. Add the fried egg on top of the pancetta, and sprinkle with parmesan. Close the sandwich with the other half of the biscuit. Serve and enjoy!